I have a feeling that “somebody” was probably Johnny Depp. (Hey, Thirteen was pretty lousy at being a typical 13-year-old.) Therefore, let it be known that were it not for Johnny Depp, “Buster and Babs Go Hawaiian” might never have become an episode. Um… sort of. Of course, we had no clue that Tiny Toons was a syndicated show (at that time, at least; it later went to Fox exclusively). The only thing we could think of was to send it in care of the Fox network where we watched the show, so that’s what we did. By this time, it cost almost three dollars to mail it. We never made another copy of it. We were going to, but Xeroxing it would’ve cost too much change, and we didn’t want to take the time to make another handwritten copy. We just figured that if it got lost in the mail, then it did. So we didn’t worry about it. In a way, the story did end up getting lost in the mail — or at least, it took a winding path to its intended destination. Our story was sent to Fox in Burbank. Jean [MacCurdy, executive producer] said that, under usual circumstances, it never would have gotten past Fox. It would have been stamped “Return to Sender” and sent back. I think you’ve caught on by now that nothing about the next several months is going to involve “usual circumstances.” Bear in mind that sending an unsolicited story or script to a television show sets off a whole host of alarms from a legal standpoint — for example, if they were to inadvertently do a similar script in the future, we might claim they stole our story and sue — so nothing’s supposed to be opened or read. However, the people at Fox opened the envelope. They took our story (and the letter that we enclosed) and put it in one of their envelopes. Then they sent it on to Steven Spielberg. Steven’s secretary sent it on ahead to Warner Bros. Jean said that the secretary probably figured if it got this far, it must be okay. She said that it was basically sent to people who didn’t really know what they were doing. This was all told to us second- and third-hand and maybe some other hands besides, so it’s possible the timeline isn’t 100% accurate. The point, though, is that our package looked legit when it got where it was going, which eventually was the desk of Jean MacCurdy, the executive producer of Tiny Toons and, at that time, president of Warner Bros. Animation. I drew the story on notebook paper, page by page, day by day, usually at school but sometimes at home. It wound up being in four parts (each part with its own title page and credits), with each part stapled, and as each one was finished, it got passed around to our friends at school to read. It was never really a conscious project. By that I mean, we never really got together with the express purpose of working on the story, and we certainly never thought, while it was being created, of what would happen to it afterward. 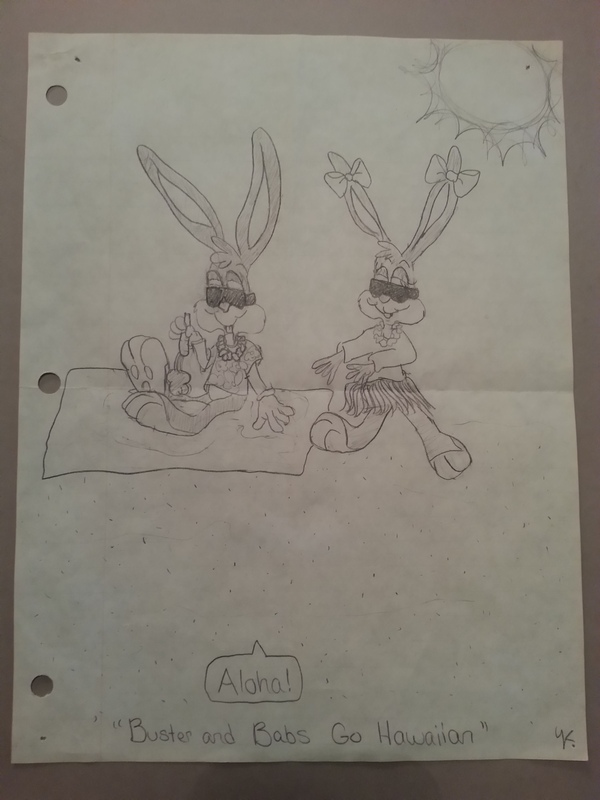 We didn’t sit down with the idea of “let’s write a Tiny Toons script” (especially since it wasn’t actually a script), and we certainly didn’t start out with a notion of sending it anywhere. It was something to do. It was fun. We put things into it that were fun for us, little in-jokes our classmates would get — we had the boring history teacher narrating the History of Q-Tips, we had a fake credit of “Person Who Can’t Draw: Sarah Creef” (apparently to acknowledge that while I did most of the art and Amy did a couple drawings of Elmyra, Sarah’s contributions were story only), and another fake credit poking fun at our English teacher. One gag — the overflowing tub of bubbles — I even stole from a story my sister and then brother-in-law told from their honeymoon. There were no thoughts, at that time, about the end product. It was all about making and sharing, and looking back on it, I love that innocence. That’s the kind of creativity Thirty-Eight spends a lot of time trying to recapture these days, of what it was like to do something without worrying about the fate of the end product. Really, there wasn’t a lot to do in our hometown back then, especially at that in-between age, so you had to be able to make your own fun or you usually wound up getting in a lot of trouble instead, just out of boredom. I was trying to finish Part Four (and hopefully end the story), but I couldn’t think of an ending. Finally I got kind of frustrated and decided to stop for a while. Well, just then Amy called. She suggested an ending, and I used it. Her idea was to have Babs and Buster go on a cruise, get shipwrecked, and float (in a two-man life raft) back to Acme Acres. Boredom + creativity + serendipity = ? I don’t remember a time when I wasn’t drawing, and I barely remember a time when I wasn’t reading and making up stories to write and illustrate. Besides coming up with my own characters, I was always trying to draw the ones I loved from movies and TV: Brain from Inspector Gadget, My Little Pony characters, Thumper and Bambi, Roger Rabbit. Now I had new characters to draw, and the first ones I chose were my favorites, Buster and Babs. As always, most of my drawings were on notebook paper with a #2 pencil — not because I didn’t have tons of sketch pads and things at home, but because it was easier to draw (read: get away with drawing during class) at school when you were using something you always had in your bookbag anyway. This time it was at lunch, sitting at our table in the cafeteria. Yeah, I don’t know what’s going on with that blanket either. 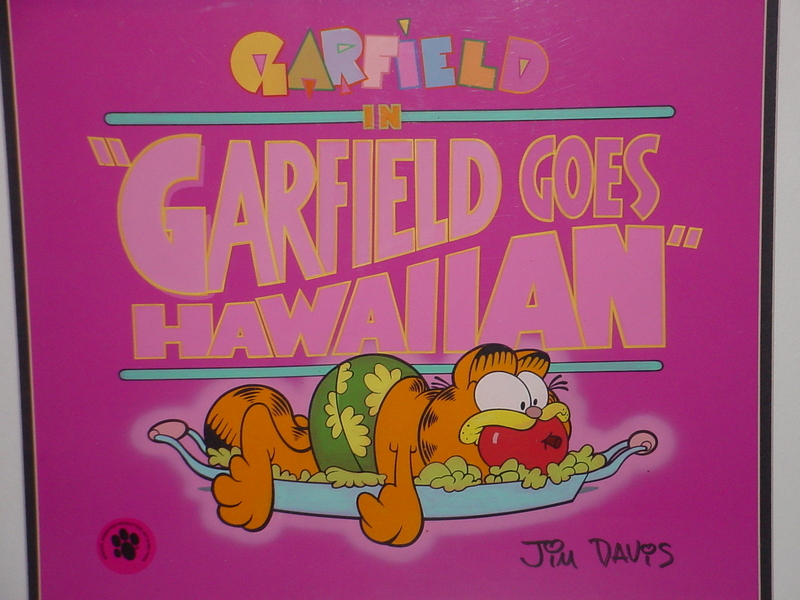 Somehow or another, I got the idea to write a story about Babs and Buster taking a vacation to Hawaii. Very needless to say, everything would go wrong on their trip. Hey, Thirteen — you’re going to need a lot more notebook paper. Up next: So what do we do with this thing? Great. The very first page and already I’m ahead of myself. So give me a moment to explain. So where do I start. At the beginning. Let me see here. Thanks, Thirteen. I’ll take it from here. First off, Thirty-Eight just wants to say that with a few bright exceptions here and there, seventh grade royally sucked. I mean, I doubt it’s a great time for most people — middle school/junior high is one of those horrendous transition periods of life, and nobody tells you that (especially if you’re a girl), hey, you know all those great friends you had in elementary school? Half of them are probably going to turn against you for no apparent reason, because you’re all trying to figure yourselves out in relation to everybody else in your social circle, and you’re going to spend way too much of your time trying to figure out what’s the mature cool thing to like and what’s the babyish kiddie thing to like that’s going to make you an outcast, and the rules are constantly changing and you can’t win, and it’s all sort of a massive waste of time anyway, and sometimes the best thing that happens is that you survive it, but nothing much is really going to make it better while it’s happening. Looking back, I’m actually pretty grateful that I can say I had mostly one bad year in my school life. For some people, the bad years stretch on a lot longer and contain things infinitely worse than what I went through, so don’t get me wrong here — I’m not claiming any medals just for surviving basic adolescence. That’s just a setup to the fact that some of things I liked weren’t exactly considered trendy and cool. Back to the school library. I ran into a friend there while I was looking for a magazine article for my research paper. I look at what she is handing me. 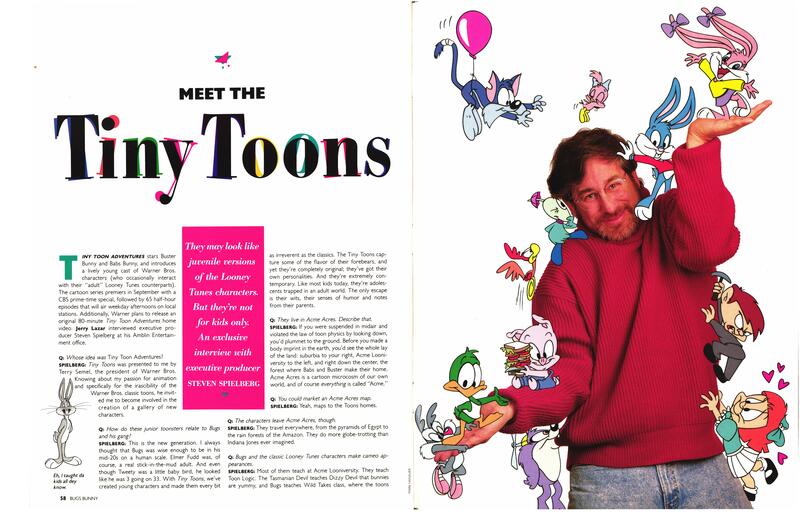 It’s an article about something called Tiny Toon Adventures. Intrigued, I read on. 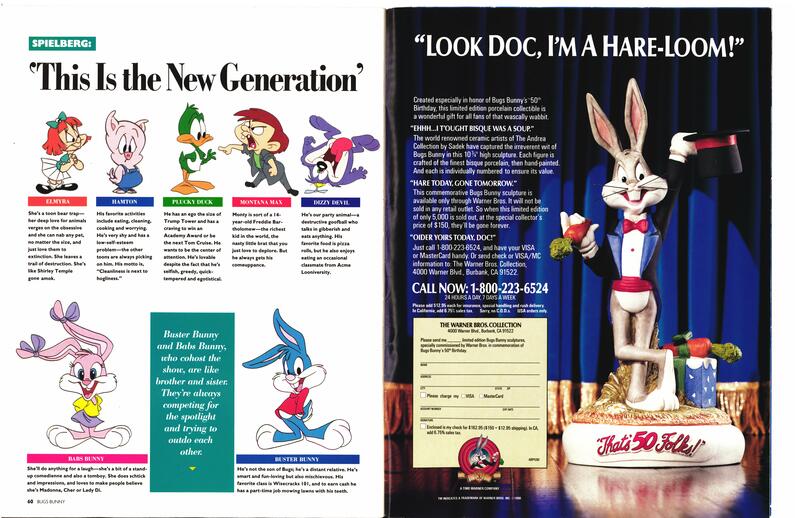 The article was part of a insert celebrating Bugs Bunny’s 50th birthday. 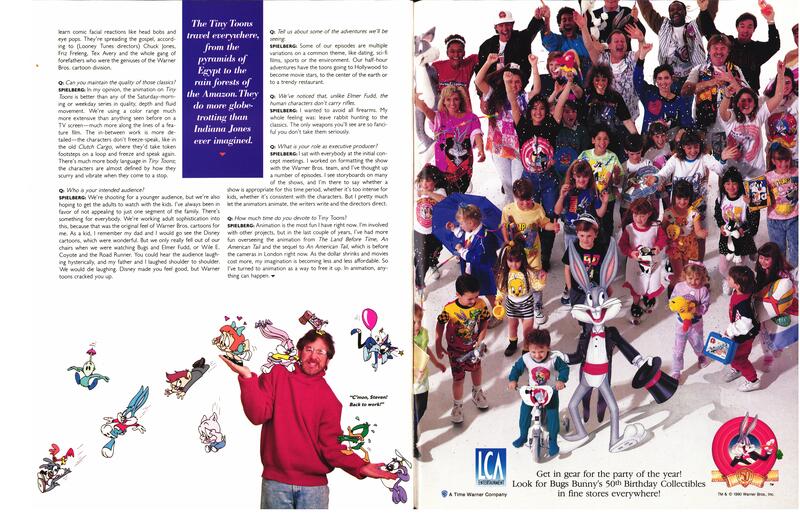 Years later I found a commemorative magazine that also included the same piece. Here it is from that source (click to enlarge). As I look back, I wonder what I saw in the show. Maybe it was because the characters were cute. Maybe it was because I’ve always loved cartoons — Looney Tunes especially. Maybe it was because I’m weird. Later on, I saw an ad in TV Guide for the show’s premiere, which the Internet helpfully tells me would have been September 14, 1990. I watched the first episode, I loved it, and I had no idea how much that show was going to influence the next few years of my life. Yeah, eighth grade was going to be a whole lot better.